This post is one of pain. My brother-in-law died in a car accident 2 days ago. We were not close, we did not see each other often, but all my memories of him are positive ones. He was full of life, of energy. I liked him. He was younger than I. I don’t know if he was a “good man” or not, but I do know that he did good in the world and he served his family and his country. I lived through Sept. 11, 2001. I was in NJ. I was at work when the reports started coming in. We were watching when the airwaves went dark because transmitters fell. The fighter jets thundered overhead, shaking the building. I had to pass police barricades to get to my son. I watched people jump. I don’t need to remember. I have never ever forgotten. My soul was seared. I read a blog today by someone I (usually) respect. The implication I heard was “enough already, spare us all your recapitulations. other innocents in the world have been killed and no one mourns them”. I, too, am overwhelmed by the recounting and retelling. But the fact that other innocents have suffered and been killed does NOT diminish the pain of those who suffered here on September 11, 2001. Do NOT deny ANYONE the right to their grief, to their pain, to their memories, to their expressions of emotions. Loss is loss. Pain is pain. We do need to heal the world to try to stop murder such as September 11, 2001 and all other such murders. But people in pain need to mourn. This post is poorly written and not very clear in its message. But I think what I might be trying to say is – Let the mourners mourn. Ignore the parts of the grieving that do not work for you, but do not belittle or deny the mourners. Start working to heal the world today, but understand that some people might not be able to join in that effort until tomorrow. I’d forgotten how much fun it is to be part of a photo shoot for Callipygian Christensen. She invited some friends to join her, giving only the vaguest understanding of the purpose of the poses. We got there. She told us the name of the image: “Another Day in this Carnival of Souls”. Then she told us how to dress: ethereal/surreal/spiritual/carnival. *Blink* As Dale pointed out – spiritual and carnival are sort of antonyms. I was a bit worried. I didn’t think I had anything in my inventory that was carnival or ethereal. I watched as the others started rezzing outfits and skins and hair. It was the discussion on changing skins that enabled me to act. I remembered my beautiful drow skin called Chromatic from Trap. I put that on and decided to add a tattoo. I added my Bare Rose Black Salamander outfit, thinking that maybe I would only keep parts of it. But once I had it on, I rather liked the effect in combination with the other outfits I saw. What I didn’t like was my hair. Originally I’d thought I’d wear my pink hair, but I couldn’t remember the name, and it wouldn’t go with the Salamander outfit. I rummaged about for something else and came up with my Curio Spiky hair. I’d gotten this a LONG time ago for one of the fashion shows at Shengri La. As I couldn’t think of what boots or shoes would go with the outfit, I decided to stay in my socks. We all jumped onto pose stands or couches and Calli flipped us through the poses. She moved the stands about up and down and around. The interesting thing is to try to guess what angle she is using when she shoots. I, not being anything remotely like a photographer, NEVER guess her approach. 🙂 I take my shot straight on, trying to see everyone’s faces. The other fun part is when we all get silly and joke in local. Many of us have done this before. It’s fun to play at regressing to childlike siblings, whining and teasing. But you get to see the REAL picture and much much more. Calli is showing her work at Galerie 17 in New Toulouse Bourbon. 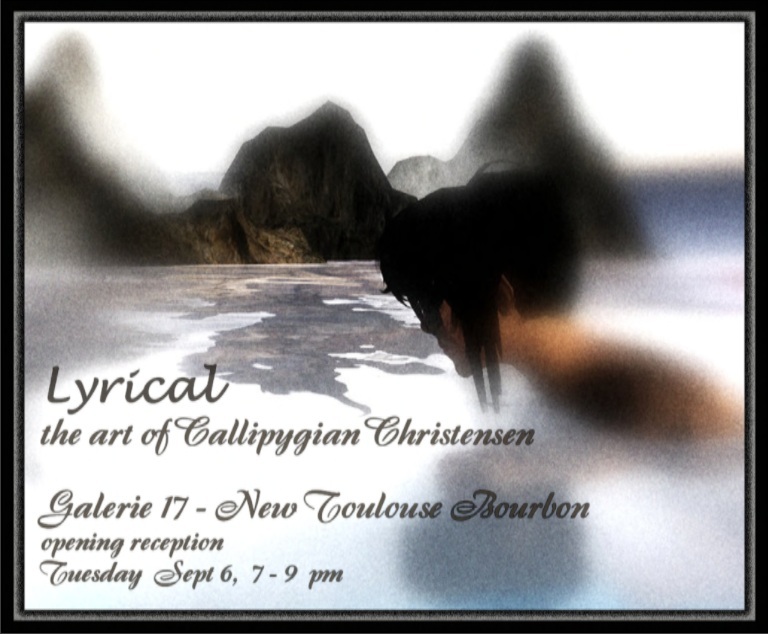 The opening is Tuesday, September 6, 2011 at 7pm SLT. The show is titled Lyrical since the titles of photos are song lyrics. These pictures will be on display for the month of September. I had the pleasure of keeping Calli company as she hung the pictures in the gallery. I was quite proud when I finally recognized one of the songs without searching. Perhaps pride was not the best response, as the song I recognized was “Rubber Ducky, You’re the One”. *grin* Come and see for yourself what Calli saw when she looked at her ethereal/surreal/spiritual/carnival friends. See how many lyrics YOU can recognize without having to search on the phrases. 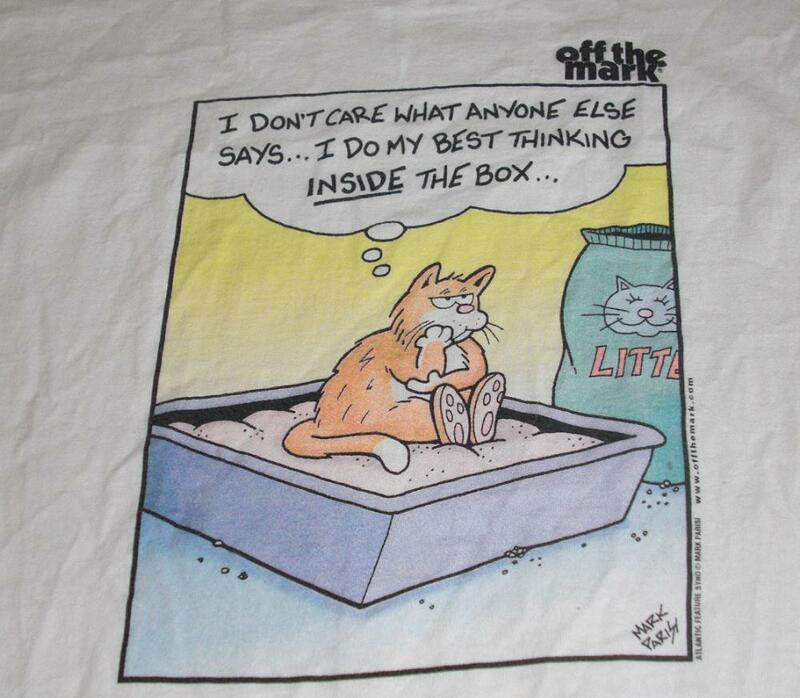 That reminded me of one of my favorite t-shirts, pictured below. I realized that I needed to credit the cartoonist whose work is on the shirt. I did a search on “Mark Parisi” and “Off the Mark” and wow! He’s out there with TONS of great cartoons. So I do hope I’m not violating anything here by posting a pic of my t-shirt and I do urge you to check out his work. I spent a LOT of time clicking through the cartoons on his website and laughing. A definite mood-picker-upper. *grin* Thanks, Mark Parisi!!! Started getting some laundry done now that I can move in the basement. Cleared the deck of branches and leaves and debris. Left a message with the cleanup company. Oh – guess it’s time to do that again. Spoke to the township about when/how to dispose of the carpet lining my driveway. My brain isn’t working. I stare at text glassy-eyed, trying to make sense of what I’m seeing. I hurt from an injury and from all the lugging and dragging. I’m still exhausted. I have a non-stop headache. Not only from all this flood-nonsense and the physical pain, but from the ceaseless sound of fans blowing in the basement. And from the construction behind me at my neighbor’s house. Right now heaven would be a long peaceful nap in a very very tranquil environment. So at the end of the day, I did what I could to relax. 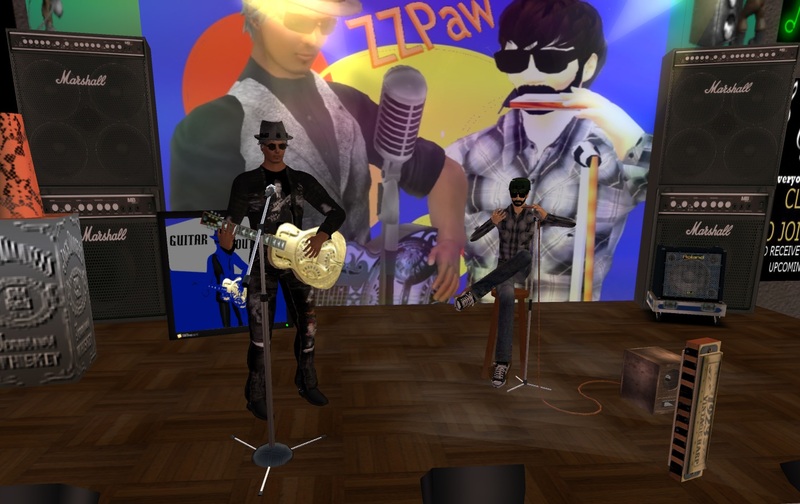 I headed to Buddy’s Bar to hear Ziffy Zarf and Guitar Southpaw play that country rock and blues. Bliss. My favorite moment came when they segued into a great rendition of Buffalo Springfield’s “For What It’s Worth” and then segued into Donovan’s “Season of the Witch”. Absolutely great. At that point I had enough energy to deal with more laundry and feed the animals and feed myself. I keep forgetting to eat. And yet I’m not losing weight. Sigh. 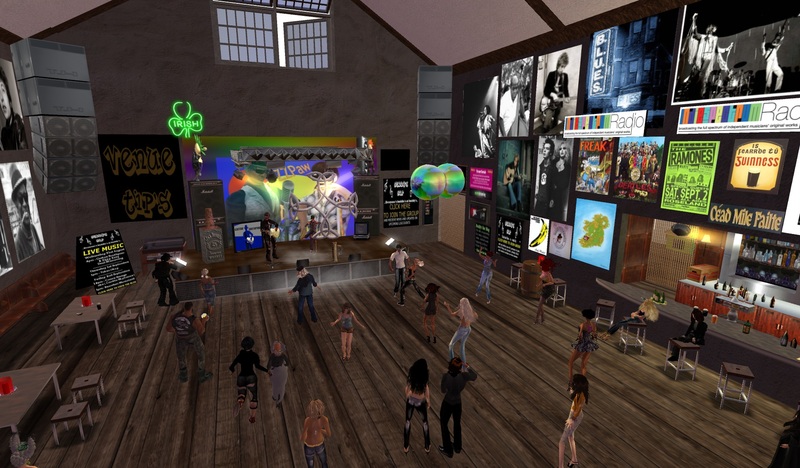 Then back into SL for BigJim Allerhand and Tabasco at Club CTO at Marathon Caye. CTO is Cranston Yordstorm’s club. 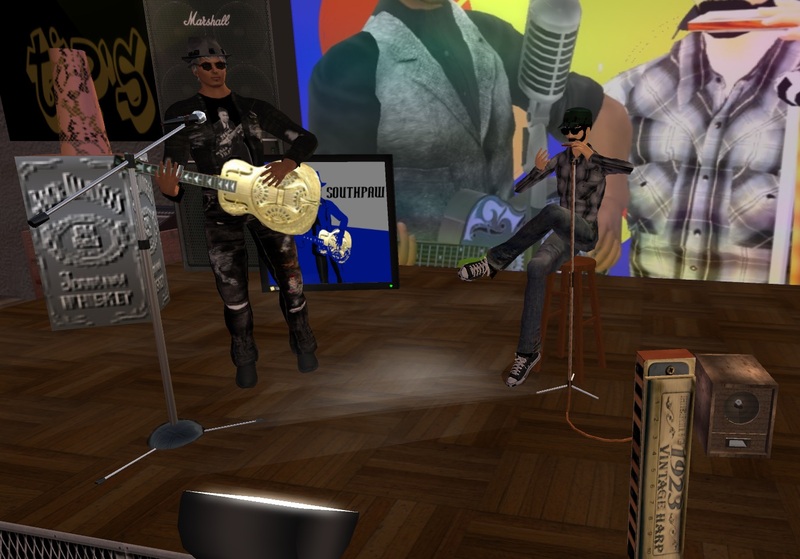 I got there a little early for BigJim and Tabasco and discovered that Cranston is an VERY fine singer, rocking the place with swing tunes. From there to Fogbound where Callipygian Christensen was DJ’ing. After that music infusion, I was able to sleep a bit. Because, of course, there’s always tomorrow.